2.) I wish to have a small business for this year. Something that would keep me busy if one day I decided to stop working. I already have several plans but I've always been a careful planner. I have this habit of weighing things carefully before I go in which I think is good for me. Also, I would like to start small then progress to something bigger when things go into my favor. I hate to take risks. 4.) A vacation well spent with the whole family, well...not necessarily out of the country as me and my husband are already always out of the country most of the time due to work. Something simple but memorable weekend get away perhaps. If I could bring my kids for another out of the country trip this year, then that would just be a bonus, but I'm not listing it down as one of my priorities for this year. (lol) Sorry kids. 6.) I would seriously look at improving myself in the kitchen, so I am expecting myself to cook and bake more this year. 7.) I would like to beat my last year's earnings from my blogs. I know that by saying this, I am giving pressure to myself already but I should strive to get better each year, right? 8.) To move on with my life and letting go of all the heart aches and pains that I experienced for the past years. To do what must be done and to only keep the positive things and thoughts in mind and get away from all sort of negativity's that could ruin my passion for life. 10.) To start crafting which is one of my love and passion but due to a limited time, I always fail on this and it always gets forwarded to my new set of goals for the following year (hehe). 11.) To be more conscious about my health and this means having preference on eating healthy foods and going for regular check ups. Learn yoga and other simple exercises. 12.) To have a substantial amount of savings. I always do this each year, but I have to be better this year. Whether I achieve these things or not, what is important is that I have set my goals which I can look forward to this year that could motivate myself to strive harder in my work and in improving myself on every aspect of my life. This will keep me going! That's a whole lot to accomplish but knowing you from your blog posts, there's no stopping you and you are quite an achiever. Wish you the best and may you even surpass all your expectations this year, sis! I had your number one goal in my list for several years now. I need to take it seriously. I don't want it on my list again next year 2014 :) Goodluck to us! I noticed that most of your goals are financial, while the others are family-oriented - almost the same as my goals. Good luck! wish you accomplish all of them this year and if not, the next years. Wish you could accomplish what you set out to do this year. :) They are doable, by the way, so am sure you'll get to do them. Great goals for the year. Hope that you will be able to achieve all. I hope you would achieved all. :-) Have a great year ahead. Good luck on your goals. I love the idea of an herb garden. Makes it cheaper and fresher produce. Yum! 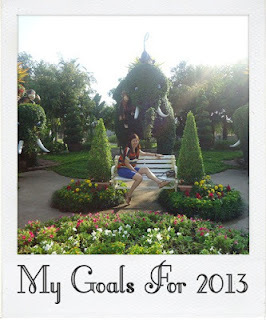 Got lots of goals this year. Thinking positively will make you reach and accomplish such goals. Good luck! with property taxes, you can get discounts if you can in advance. my dad did the same so i just followed his lead. Those are many goals! Good luck and hope you achieve them! You are blessed to have your own home. i also want to own a small business this year but i still don't know what's the nice investment..Anyway, i am eyeing to focus more on blogging and hopefully more molahh.. I want it this way! The goals may serve as an inspiration to check if these would be achieved! So many goals... good luck! I want no. 2 wish to come true soon soon soon! Really admire you sis for being so organized. Ikaw na talaga! Hope that you can reach the above listed goals of yours. With the dedication and discipline, you can surely hit them all. Great goals. I agree with what you said,every aim to be better than what you were last year really needs effort. i think its great to have a goal to begin with. i hope you meet all of them this year. You definitely accomplished a lot in 2013 and I wish you more success for this year. You did great!